While conducting research for a manuscript, I was surprised to discover that many of the U.S. organizations that operated during WWII were actually created before or during WWI (also referred to as The Great War). The Office of Civil Defense was one such organization. When the Lusitania was sunk in 1915 by a German U-Boat, the government inaugurated the Council of National Defense, modeled after Great Britain's system. 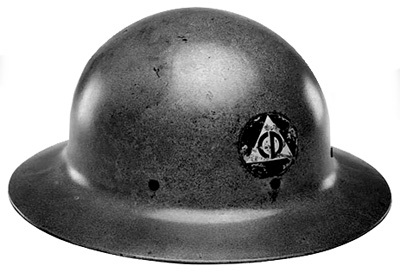 CND's initial charter was to promote protective measures and elevate national morale. Fast forward to the spring of 1941. No doubt recognizing that war was imminent, President Roosevelt decided to step up home front defense. He advised communities to reestablish or organize their own local civil defense councils, which had waned substantially in the years since World War I. To coordinate and assist the new civil defense system, Roosevelt replaced the CND with the Office of Civil Defense (OCD) on May 20, 1941, and named New York mayor Fiorello La Guardia as the first director. For the first several months, little public enthusiasm existed for civil defense. Then Pearl Harbor was attacked, dramatically changing the American public's attitude. Many local civil defense units quickly formed, and OCD was overwhelmed with requests for information and assistance. 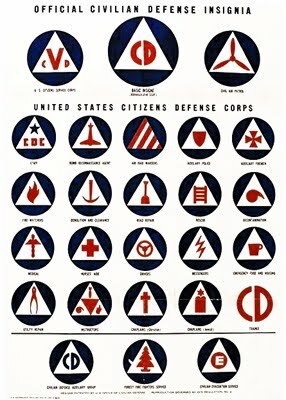 To help organize the civilian volunteer efforts and provide adequate training for volunteers, the U.S. Citizens Defense Corps was established within the OCD in April 1942. Locally designated wardens and various auxiliary emergency workers were the core of the system. Specialists included air raid wardens, auxiliary firemen, auxiliary police, emergency food and housing personnel, chaplains, air patrol workers, decontamination specialists, demolition experts, fire watchers, instructors, medical corps, drivers, messengers, nurses' aides, rescue squads, road repair crews, and utility road squads. Members wore insignias on their helmets and armbands to identify their specialty. The OCD symbol was a white triangle inside a blue circle. Specialists' armbands displayed a unique insignia within the OCD symbol. The Civilian Voluntary Service organized a variety of volunteer efforts, including scrap drives, victory speakers, victory gardens, and neighborhood block leaders. Another group was responsible for getting survival information out to the public. Because the technology of radar was still in the development stage in 1941 and the coverage provided by existing radar installations did not extend to many coastal areas the Aircraft Warning Service (AWS) was created. Men and women called spotters watched the sky for enemy aircraft. Another auxiliary assisted the Coast Guard, patrolling the coastline for enemy ships and guarding port facilities in addition to the traditional duties of sea rescue. Notable volunteers included actor Humphrey Bogart, who operated his yacht on several patrols out of Los Angeles, California; and Boston Pops Orchestra conductor Arthur Fiedler, who helped patrol Boston Harbor in Massachusetts. 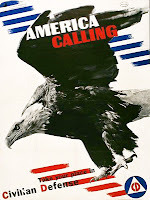 The Civil Air Patrol (CAP) was another major part of civil defense during World War II. CAP pilots were given two hundred hours of special training, and by March 1942 they were on patrol duty looking for enemy submarines as well as conducting search-and-rescue missions. At its height over ten million citizens served in one way or another within the civil defense service.